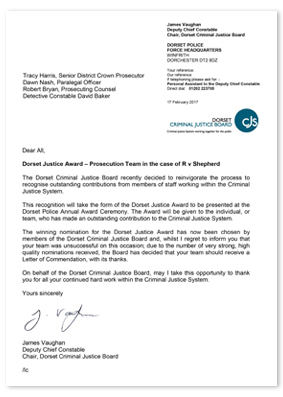 Further to their handling of R v Shepherd last year, the entire prosecution team received a letter of commendation from the Chair of the Dorset Criminal Justice Board, Deputy Chief Constable James Vaughan. For more information on the case, see this news item from last year. The case was technically difficult and needed sensitive handling due to the horrific nature of the offences and age of victims. The prosecution team were nominated by the head of CPS Wessex RASSO unit for their outstanding contribution in gaining the conviction and the manner in which they conducted the case. All at Drystone congratulate Robert and the rest of the team on a job well done.